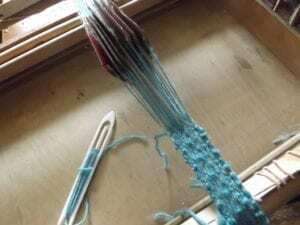 Tablet weaving or card weaving is ancient and low tech. It produces narrow bands that are strong and decorative, used for belts, straps and trimmings. Ever curious to try out new techniques, this is just a little dabble. As the name suggests it uses tablets or cards. These tablets have a hole at each corner into which the warp threads are strung. 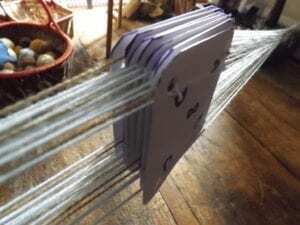 There’s no need for a loom, the tension is created by attaching the far end of the warp to a fixed object and the working end is tied to the weaver with a belt or back strap. This makes it cheap, portable and accessible. The shed is created by turning the cards forward or back a quarter turn according to the pattern. The corner holes are marked (A,B,C,D) and the cards numbered (1-8 in this case) making it easier to keep track of where you are, although presumably in the past the weaver used unmarked tablets. Originally the tablets were made from wood, bone or leather. These days playing cards cut into squares work perfectly well. As usual, research consisted of checking out online tutorials. This one is short and easy to follow. In theory you can use any yarn. The first attempt was DK merino yarn which was nearest to hand. However, after a few inches the yarn was already starting to get fuzzy. This was tied onto the box loom – making photos easier. The shuttle is a netting needle. Time for another go, this time using high twist 4 ply wool/nylon. It all seemed to be going well. 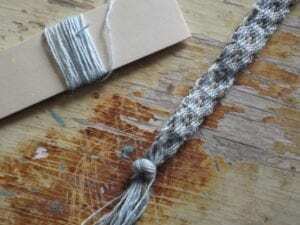 Although the weft was a little tight to begin with, making the band too narrow (that’s one lesson learnt). A pattern was emerging But it wasn’t really looking like the demo video. Tablet weaving is warp faced – that is the weft thread is hidden under the warp threads, only showing at the selvedge, so it’s just the warp threads that create the design. But then turning it over to look at the underside and A-Ha there were the chevron patterns clear as day. Something’s wrong somewhere. 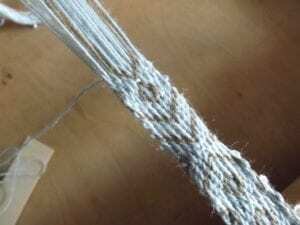 Tablet weaving is ‘simple’, but also complex in the way the warp threads and turning of the cards interact. So perhaps this is caused by the direction of the warp threading, which can go left to right (S threading) or right to left (Z threading), or maybe the way the cards were facing the wrong way. Seems it all got turned upside down at some point. Easy enough to turn it all over and carry on, but that’s not ideal so a little thinking to do.